It’s been a long time coming, but 5G is finally on the horizon. It promises ultra-fast broadband via a mobile connection, eliminating the need for wired infrastructure. Mobile operators hope it’ll be their new cash cow. But could it devastate traditional pay TV, particularly in emerging markets? There’s a lot of buzz about 5G right now. Successful tests at the Winter Olympics and World Cup have proved it’s possible. Device manufacturers are testing the first compatible phones, with handsets expected in the shops in early 2019. Some mobile operators have even committed to (very limited) 5G service roll-outs before the year’s end, with lucrative video deals likely to be bundled in. It’s not here quite yet, but it’s coming. For many, this is great news. MNOs hope their wealthier subscribers will pay a premium for the convenience of streaming high-quality content, including 4K, to their mobiles without having to endure buffering. And ultra-fast mobile broadband could be a life-changing connectivity revolution for those parts of the world where even basic broadband penetration remains comparatively low because of challenging geography and low median incomes. For many of these markets, 5Gwill bring their first real taste of the online life many of us have taken for granted for years. 5G may not be good for everyone, however. Most pay TV operators in developed markets are used to competition from Netflix, Amazon Prime Video, and regional OTT services. But in emerging markets like India, Pakistan and Latin America, operators could safely assume the lack of reliable broadband infrastructure (particularly for vast rural populations) would insulate them from such threats for years to come. Now that, to quote Game of Thrones, “Winter is coming”, is their insulation rapidly disappearing? Get OTT ready – if you don’t already have rights deals, infrastructure, and content security in place to deliver high-quality content OTT to your subscribers, now is the time to prepare before international rivals swoop-in to steal your thunder. Think Hybrid – start work now on planning a new generation of hybrid set-top boxes. If your STBs are already in homes when 5G coverage arrives, you’ll be ideally placed to deliver your subscribers’ first taste of OTT viewing. Make Friends – many operators feel it’s safer to have OTT providers like Netflix as partners rather than rivals. If your organization – and your region – is relatively new to the world of IP-delivery, consider a joint go-to-market strategy with OTT competitors from day one. We don’t know exactly when 5G will go mainstream, but that’s not a reason to ignore it. 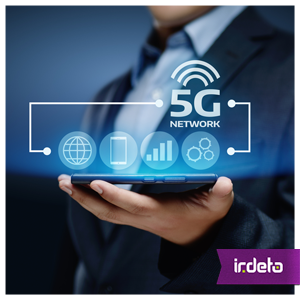 5G is coming, we all need to be ready! This entry was posted in Media & Entertainment and tagged 5G, Amazon Prime, broadband, hybrid, Netflix, OTT, pay-tv, pay-TV operator;. Bookmark the permalink.